It is widely believed that this Government is incapable. Even in the areas where it exhibits its capability, the progress is very slow. There is no doubt about it. However in certain areas, even though it displays an incapability, in fact it is not incapability but capability. In this article I would like to discuss the last point. The public consciousness of this country is formed to suit to an authoritative regime and not to a democratic regime. Parents think that the children should obey them. When the children try to be independent parents influence them. Siddhartha type of rebellion children would definitely be condemned. Therefore children would take longer time to be independent even after they become adults. Children are not encouraged to question teachers in the classroom. Not even at universities unfortunately. In this country teachers teach and in the countries where there are different cultures students learn. That is the difference. In workplaces decisions are taken by the higher officers. Others are reluctant to take decisions even if they are allowed to do so. This is evident in the Public Sector very often. In all these instances there is a gap between the two parties, parents and children, teachers and pupils and employers and employees. This is evident among priests and disciples and doctors and patients, etc. When a doctor examines a patient in channel practice, the patient has hired the doctor for that period so that the due respect should be given to the patient by the doctor. However both parties forget this basic relationship. This gap is prevalent among the rulers and those who are ruled as well. During the last regime Mahinda Rajapaksa who won the war was elevated to the kingship by the general public. Thereafter he thought of becoming a king himself. That was the origin of the 18th Amendment to the Constitution of Sri Lanka. Public at that time gave their blessings for that. Very often different ideas within a group are not promoted. If someone of the group is having a different idea it is often taken personally by the others. People hardly know how to keep the ideological differences at that level and continue the friendship. However politicians have mastered this art. These behaviours are backward and detrimental to a democratic culture and those behaviours promote authoritative regimes. This Government lifted the democratic traditions of this country which were long buried. For instance recently Chief of Staff of the Presidential Secretariat and the Chairman of State Timber Corporation were arrested by the Commission to Investigate Allegations of Bribery and Corruption (CIABOC) over an issue of taking a bribe. Daily FT newspaper reported it on Friday 4 May with the comment that the President was aware of the arrests before they were made. CIABOC objected to the comment and said that the President had not been notified beforehand as this would have been in contravention of the commission’s independence. Daily FT regretted and published it on the following day. We can observe the boldness of the CIABOC and acceptance of that boldness by the President. It was not reported that the President has threatened the officers of the CIABOC over this issue. Instead he ordered the suspension of these two officers. This is democracy in operation. This can be compared with the performance of the previous regime. The former President protected his supporters who have broken the law. He did not hesitate to say that in public. 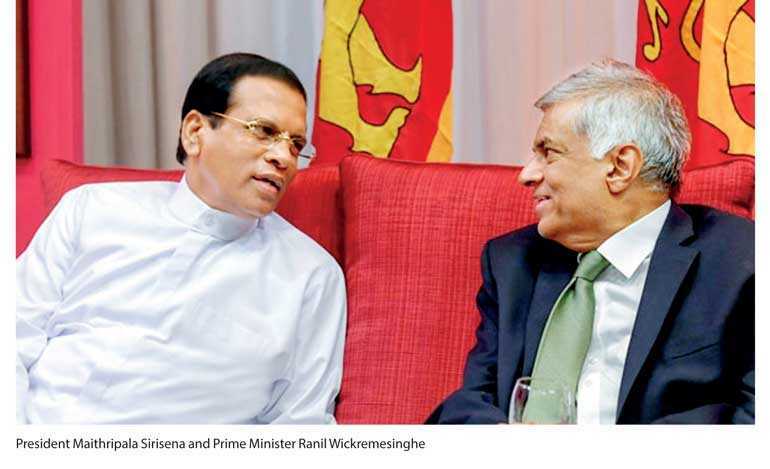 At a function held at the Institute of Chartered Accountants of Sri Lanka he openly said that he must protect his own people who broke the law. Ironically, he has selected CA Sri Lanka which promotes good governance to say this. The underlying thinking of this statement was, in addition to the kingship the people had granted to him and the authoritarianism exercised by him, that the public consciousness of this country places treating the own man ahead of justice and equity. In Western countries where democracy is established for a long time, justice and equity are at the helm of their value system. That is why they protest vehemently when those values are undermined. Therefore progressive and unbiased democratic traditions introduced by this Government work against the backward and biased public consciousness of the country. That is why they cannot digest it. People might view the above incidence and similar incidences in a different angle. One angle is that there were thieves in the previous regime, there are thieves in this regime and therefore both regimes are the same. Another view may be that the people who have done malpractices in this regime are caught and those who have done the same in the previous regime are escaped because they have not done anything wrong. However we all should realise that there is a change of the behavioural pattern of the Government which is in favour of the people of this country although that change is not in line with their consciousness. The situation created regarding the murders committed during the previous regime also clashes with the democratic traditions. People come to know how the defence forces and the intelligence units worked during the previous regime. It is true that the investigations are delayed and the defence forces do not give the adequate support to the courts. It is also true that the accused try to create a public opinion that this is a witch-hunt of the war heroes. Actions of the President proved that he also was of the same view. Those who have this view keep their men over and above the justice and equity. So called war heroes, or for that matter anybody, do not have any authority to kill innocent and they should be punished for that act. At the same time if they have done a service to the country they should be commended with no hesitation what so ever. However, these two should not be mixed up. This mixing up is in the public consciousness of this country. Buddhism, followed by majority of them, refuse this mixing up through law of karma – ‘karma niyama’. According to the law of karma one must face the consequences of their deeds separately. Public consciousness of this country is not in line with the basic teachings of Buddhism. Instead thinking and the values of the West is in line of the basics of Buddhism. The public does not have any understanding of the day when these their men turn the guns against them. These men became their men against the Tamils. Those who supposed to have a high literacy rate should know the instances where their men who were safeguarded by them turned the guns against themselves.